include nurturing, and growing an email list. 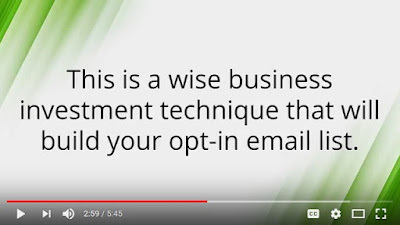 One of the most popular ways to entice people to sign up for an email list or newsletter is to offer something of value in exchange for an email address, name, and sometimes other information. Often, that valuable offer involves an information product or related digital download products. You may be sick of hearing it but you need to know your audience. You need to know what keeps them up at night. You need to know what they do in their free time. You need to know if they have extra money that they can spend. You need to know what their problems are in relation to your ability to help solve them. Then you’ll create the solutions. When you know your audience well enough to know where they hang out and where they get their news / information, you know where you need to develop a presence. If your audience is there in large numbers, you need to be there too, but only if you share at least a small interest in the group or topic. If you can’t hold your own in the group or you’re not a good fit, ask the admins if they would be interested in offering their members a related information product that covers a problem that both groups have. Knowing who your audience is and the topic you’re going to solve for them you can start creating amazing content. Write blog posts, create reports, write eBooks, and more. Create video content, webinars, and more content that attracts your ideal audience. You’ll need content for your blog, for social media platforms, and you’ll need a mix of content. Your mix should contain text, images, and videos, both readable online and via download. When you create content, remember that you give away the “why,” and sell the “how.” This helps you separate your free content from your paid content. If it’s a “how to” you may want to save it for sale or you may decide to give away that one “how” in a list building exercise if you have a good upsell that you can follow with. Because remember, if you have a list you want to sell to them too. That’s what makes it all worth it. Develop a content calendar and publication calendar that helps you know what you’re creating so that you’re ahead of the content creation game. For example, if you know that you want to publish things about Thanksgiving end of October and early November you’ll want to start finding and crafting that content three or four months before. You can find private label rights content (PLR), have a writer create it, or do it yourself if you have set up your work schedule appropriately. The publication calendar can also be used with your affiliates as well as your list members. The calendar can be used to promote what’s coming up soon to help you build buzz early and by habit. It’ll give your customers, your list members, and your affiliates all a chance to get on board with you in advance so that when you do have the launch of anything new you have lots of takers. One thing you have going for you today when trying to build your email list is automation. Today, the automation for capturing emails is amazing. If you use landing page software integrated with your autoresponder software, you can make the entire process so seamless that it feels super easy for everyone involved. But you want to use all this automation wisely. Avoid Too Many Popups – While you do want to put your freebies and offers in multiple spots on your site, you don’t want to have too many aggressive popups, slides, and pop-unders for your visitors to deal with. In fact, you should use the technology to deliver the pop-ups to only new people or people who haven’t clicked away from them. That way they won’t be bothering anyone. Don’t Dazzle them with Your Technology – When anyone comes to your site and gets on a landing page that asks them to do something such as buy, download something, etc. you want them to be as undistracted as possible with the technology that is going to control everything that happens based on their behavior. Personalize Everywhere – Wherever you’re allowed to add personalization make sure you do that. People respond more to personalization even when they know it’s done with a machine. They like it when their name is mentioned, and when it feels more personal that way. Control How Many People See the Popup – You can often control the pop-up and let it be shown to only certain first-time visitors. You can make it show up every five visits or some other pattern. Look into your landing page software to find out how to accomplish this. Behaviour Match – Many types of landing page and autoresponder software can also perform some things based on behavior. That’s always your best way to set things up. If the customer does this, then the technology does that. This is going to make the experience on your site feel so much more natural to them. It’s important to use technology but you want the technology to make it easier for you and for them. You don’t want the technology to outshine what you do. You want it to give you the subscriber or buyer information and give them their information product. When you want to build your list using information products, you need to create a lot of free info products and landing pages. Even when something is free, you should have a good landing page describing what they’re downloading and how you’ll use their information going forward. Lead with the benefits for them, not for you. Make sure they know that downloading this is good for them and why. The reason you want multiple landing pages and multiple free products is that it gives you a lot of opportunities to bring people onto your email list. From a strict search point of view, more landing pages are good for SEO. Giving your audience more places to land that has a CTA, promotes a specific lead magnet or product, and is designed to speak directly to that segment of your audience will cause you to get more email list sign-ups. Your landing pages can be for freebies, low cost, and high cost paid products too. In fact, if you’ve created anything and you’re not willing to create a landing page for it then you must not be that proud of what you’ve created. If you’re proud of it, it shows. You create a landing page, you then let people know about the product by driving traffic to the landing page, and then after people sign up for your list you nurture that list with a follow-up message sent from an autoresponder that the audience wants and needs. But, the first thing is you want to give them more places to land. Studies show businesses that increase their number of landing pages always increase their sales too. The main reason is that the more entry points you have, the more people get on your list. When you have more people to your list, you simply have more buyers on your list. Studies show that with up to 40 landing pages, you keep increasing the number of leads you collect and sales you make. The reason this works is due to search engine optimization and content marketing rules. Of course, having more pages on your site garners more attention from the search engine bots. Plus, when you offer a large variety of product topics to your audience segments it means that while one thing may not get their attention, something else is likely to capture their attention and interest. The other great thing you get with more landing pages is you have more chances to market your business. You can start a marketing plan with anyone landing page at a time with anyone freebie or low-cost product to build your list. You can do more than one or one at a time, either way, your list will grow with more landing pages. You can use them as discussion starters and as answers. If someone asks you a question and your freebie is the answer, why not offer to share the freebie. Even in a group where that isn’t technically allowed you can say “PM me”. “I have some free information about this and I’m happy to share it with you if you PM me.” You’ll get lots of PMs and you can then drop them the link for the freebie. Creating more landing pages will be the key to building your list faster with information products. Information products are the perfect way to build your list whether you create a lot of freebies, low-cost items, or higher priced items every one of them can build your list one email address at a time. Now that you have landing pages, you’ll want to start driving traffic to the landing pages. Traffic is what’s going to ensure that you get more signups for your email list. SEO – When you create a landing page, you’ll want to pay attention to the SEO of the page. For example, create a keyword rich headline and title. Name the page appropriately, ensure the navigation is effective, the words on the page are all words the search engine can use, and the offer all should keep search engine optimization at the top which includes designing for mobile first. Affiliates – Your affiliates can also help you build your list. Ensure that you describe your funnel to your affiliates so that they know exactly how many upsells, cross-sells, and information you plan to promote to them. How much can they potentially make on each customer they send your way even if they send them to a freebie item? Let them know and it will encourage them to use your freebie offers to build your list and make more money. Paid Ads – Don’t turn your nose up at paid ads. Paid ads work very well for list building. You can run the ads on Facebook, for example, using some of the video content you’ve created to describe what your customers get from you in terms of the quality of the products and services you offer. Causing Buzz – Do things that get buzz. Hire five to ten influencers on YouTube to mention your product or services around the same time of month leading up to your launches. This is going to help create buzz about your work and get people curious when they see more people talking about it. E-mail marketing definitely works: .... Period! No matter what you may have heard about E-mail Marketing having Died a Death, having been replaced by Facebook, Instagram, WhatsApp, SnapChat etc – You’ve heard WRONG!! Why do you suppose sites like Google, Amazon and eBay to name but a few STILL keep in contact with you through E-mail?? …..
Because it IS the most successful, reliable and ‘trusted’ contact method since the internet first hit us all between the eyes. Check out the 19 reasons below WHY no matter WHO you are, E-mail Marketing can be your Golden Ticket to Business Promotion or simply a Residual Income Stream. An email list is an incredible asset that you wholly own and that is why email marketing works. You don’t share it with Mark Zuckerberg and you can keep using it months and years down the road. So grow it, nurture it and get results from it. 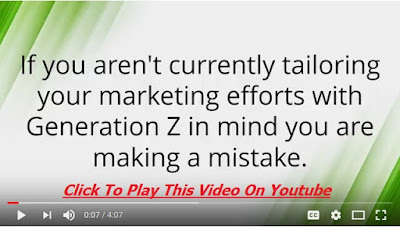 If you aren't currently tailoring your marketing efforts with 'Generation Z' in mind you are making a mistake. By 2020 Generation Z will make up half of the consumer base in the global market. Trends point to a younger generation that is more ambitious and eager to prove themselves and they are as socially aware as they are tech savvy. They have been raised their entire life with electronic gadgets and that has made Generation Z fundamentally different than the generation of their parents. One thing that stands out the most when analyzing this generation is their slant towards individualism. In general, they do not try and be something that they are not because genuine uniqueness is valued by Gen Z. What this means for you is that an attempt at emulating trends will come off as fake and phoney and will likely be rejected. It is important for smart marketers to place themselves into the viral lifestyle in order to effortlessly communicate with this audience through current viral trends. Some specific things you can do to tap into these trends are: pay attention to memes, hashtags and popular social networks and adapt what you see in your marketing efforts. Always stay true to your brand identity when dealing with Gen Z. Your values and culture must come through and appear authentic. With so many choices in this global hyper connected marketplace, it's important you offer value to the Generation Z crowd in order to capture their attention and patronage. You can't underestimate the influence social media has on Generation Z. While it is unfair to categorize the generation as selfish, it is true that appealing to their ego is a sure way to connect with them. Social media is a perfect example of this idea manifesting itself into everyday life as the social connections they make through these sites and apps directly affect their happiness. While it is tempting to label the generation as coddled or spoiled it is important to remember that Gen Z has grown up during a time of genuine recession and global war. Things like terrorism, the banking crisis of 2008 and loss of faith in their government has produced a generation of activists. Not content simply living for themselves, they'd rather leave an impact on the world when it comes to their chosen profession. They demand the same values from the brands they choose and many times will only stay loyal to companies that are conscious of their environmental footprint. Companies that produce tools that make the world a better place or represent positive ideas through branding will reap the benefits in their bottom lines. It is important then to adopt strategies that are focused on humanity as a whole as opposed to those that only help the enterprise itself. The sheer amount of imagery the average consumer from this generation will see before their 15th birthday is truly staggering. Hundreds of thousands of advertisements have been analyzed, catalogued and discarded long before they've seen yours. The best messages are those that communicate quickly and many companies have discovered that the best way to grab and hold a consumer's attention is through the use of GIFs. Because of its brief nature, the GIF is able to pass the Gen Z filter for making decisions and gives brands an opportunity to communicate. The lessons of previous generations are not lost on Generation Z. They've seen millennials try and fail to find suitable jobs after getting their degrees and they do understand the importance of securing stable income as soon as they can. But this is not a generation willing to take up an idle job to pay their bills. They'd rather donate their time to volunteer efforts or establish an online network. It is important then that you use their own brand building as agency for your own messages and advertisements. Tools at your disposal you can use include virtual focus groups and influencer campaigns. Make your customers feel like social media ambassadors and this will help you secure their brand loyalty. You must realize that you're dealing with a group of realists. 'Generation Z' is solution oriented and as long as you know this and use it in your marketing efforts they will stay loyal to your brand for years to come. Please be sure to 'Share' - 'Like' and 'Comment' before you leave. especially if you don’t know your way around the technical side of things. While there are many terrific options out there for new or inexperienced business owners, getting started can have some hassles. There are a few steps you can take to make your cyber home comfortable and cozy. Start by purchasing your very own web domain. With so many websites offering “free” domain names, this may sound silly to spend money on. But many of these sites are really just giving you a subdomain – for example: mybusinesssite.whatever.com. Not only is that difficult to remember for consumers, but if your customers mistype your site address, they could land on a site that’s offensive or contains a virus costing you valuable clients. Suddenly, your top notch website is mistakenly labeled spam and you log on one day to find it’s disappeared – deleted without warning. Your existing customers don’t know where to find you online and you’re losing out on potential customers and sales. Once you have a domain and hosting, how can you build a professional looking site with correct search engine optimization that attracts thousands of visitors each day? While you can certainly pay a web designer for a fancy site with all the bells and whistles, you don’t have to. Most hosting plans let you install the Wordpress themes and they really 'are' designed for the 'Less Techy' amongst us to produce an excellent website. The ONE lesson you really DO need to take from this post is; 'Back-Up .... Back-Up .... Back-Up'. Your host will usually do this for you with just a click of your mouse. But if not, you could really come un-stuck. You can research free open source software for building your very own website. These software packs even include professional templates for you to use. Some suggested open source software is WordPress, Joomla and others. All are great options to use for your website. And if you get a host that has Cpanel, then installing your new software will be a breeze! When you’ve chosen a niche for your business, you have to know what’s new in the field that you’re in. It’s important that you stay on top of all of the cutting edge information. If you don’t, then the details that you have will be out of date and your audience will consider your content useless. They’ll move on and spend their time and money with your competition. Trying to come up with topics that keep your content fresh and help make your niche as good as it was intended to be can be tough. But one tip you won’t want to overlook is one that’s right under your nose. If you’ve ever paid attention to the covers of magazines, you’ll notice that they’re full of attention grabbing headlines for the articles. These headlines are designed to hook the reader and make them feel like that must buy that magazine in order to gain access to the information in it. One of the best fields where you’re always going to find what’s trendy is on the cover of women’s magazines. The editors of these magazines know that yesterday’s topics just won’t keep the readers returning. They have no choice but to stay on the cutting edge of what’s hot in the world at that moment. They can’t afford to fall behind the current information or the readers will seek out other magazines. So take the time to read over the cover of magazines, especially the women’s magazines like Woman’s World Weekly. The topics they cover are wide-ranging, interesting and can fit almost any niche that you might have. You’ll always see articles on dieting because this is an evergreen topic. These articles will cover a variety of points about low carb eating, cutting out certain ingredients, or just learning about portion control. Still others will offer a menu plan for a week or a month. Some will share how to shop when you’re dieting. Or how to handle dieting around the holidays. You’ll also notice that women’s magazines cover things like stress relief. This is a huge niche and the topics that you can cover in it are almost unending. There will be articles written about how to deal with stress in romantic relationships. You’ll see ones that talk about how you can lower stress when you’re with your kids or when you’re visiting extended family members. The magazine headlines might talk about combating stress by using a method such as exercise. Or it will point out the benefits of meditation on stress. You’ll notice that these articles always bring awareness about a problem but then turn around and offer the solution. Some examples of headlines you’ll see can be examples such as stress in children, stress in teens, and stress in the elderly. You’ll see articles like what not to do when you’re stressed that cover ideas like not making a significant life change when you’re stressed. You’ll see checklists that will cover the signs of stress. Many common niches you can think of have been covered on the front of a magazine. So if you’re scratching your head wondering how to keep up with what’s new, just look at those. Obviously, you can’t stand in the grocery store and make notes of the topics that you see on the front covers of the magazines. Not only that, but you don’t want to buy an armful of magazines every time you’re looking for the trendy or hot topics. You can also go to the magazine’s main website and just read the front cover. For example, if you search for Woman’s World Weekly, the front cover of the magazine pulls right up and you can see headlines that cover the beauty niche. If you’re not part of a niche forum, you really should be. Being part of a forum community can be helpful to you when it comes to finding out what topics are currently trending. What forums do is they let you discover what potential customers are going to be looking for. It’s an inside look at where the future is heading. You’ll get a jump start on what their product or information needs will be. This will help you fine tune what you’re promoting or selling to your audience. Plus, you’ll also see what’s popular and you can use that information to bring in traffic to your site. These forums will have numerous threads where you can glean information and most of them are extremely helpful toward entrepreneurs who are new in the field. You can learn a lot simply by reading what’s on the forum and you’ll often discover that someone else has asked questions that you need answers to as well. When you need to be in the know about whatever is new that’s going on in niche marketing, you can check out the current posts. You’ll see that people there will start conversations about a topic long before it hits mainstream search engines. Look specifically for the threads that start with things like, “Has anyone heard of…” and those threads will talk about a particular product or a new research fact that will tie in to your niche. You’ll also see other topics where multiple forum users are talking. When you notice these threads, that’s a clue. It means that interest is starting to peak about that topic. You want to pay attention and get in on the latest news to use it for your business before it hits mainstream and then everyone is talking about it. Pay attention to a flurry of comments and questions when you see topics you don’t recognize. For example, right before the hCG diet became popular, there were questions on the forum about it. These questions came across as “hCG users anyone?” And just by reading the comments and questions, you would be able to learn enough information to know what it was and be able to gauge the current level of interest. You could then use that to start promotion of an hCG product or create an information report about it. You’ll also see people posting thing in the forums such as “does anyone know…” and that tells you they haven’t found a credible leader online for that topic. If you don’t know of any forums pertaining to your niche, all you have to do is Google what your interest is followed by the word forum or forums and you’ll get a long list that you can check out. You can’t capitalize on information that you don’t know anything about. You have to have the most up to date information in order to be able to compete well in your niche. Obviously, if you were to spend time every day searching, it would take up too much of your day. You’ll want to set up Google Alerts so that you can stay on top of what’s going on in the field that you want to know about. What you do is you go to Google Alerts and a search area will be at the top. After you put in the search words, you’ll have options where you can choose how you want it and where you want this information to come from. There will be a box asking you how often you want to receive these alerts. It’s important that you check “as-it-happens” because that’s trending. Getting the information once a day will put you behind the curve. Then make sure you check automatic. You’ll get to select the language that you want as well as the region. You’ll be offered a choice between “only the best results” or “all results” so be sure and check all results. You want to filter the information yourself as to whether or not it’s useful. When you set this up, it allows you to be the first marketer to whip up a short report, even a $7 one, and get it in front an audience hungry for the information. If you’re first to bring the information to the audience when there’s not much information out there about the topic, you’ll outsell your competitors because you had what the audience wanted all ready to go. There are always new trends cropping up. Some of these trends take off so fast and suddenly, everyone’s on-board. The world is always looking for new answers to the same problems and always seeking more information to help their lives run more smoothly. So new trends are going to appear in every single niche. You’ll have brand new weight loss pills, new diets to try, products that clear skin, medication that treats a variety of illnesses and so on. Since you want to be ahead of the competition, you’ll want to jump on that trending news and give it to your audience. But, you don’t want to assume that everything is going to be wonderful. There’s nothing worse than having people speak out against something you’re promoting and to be unprepared. It will make you look like you haven’t done your homework and don’t care about anything other than the money. If there’s a huge pro-hCG diet trend, then you can bet there will be a diet that comes out that talks about how bad the hCG diet is. What you want to do is if you see a product that’s trending and you suspect there will be a backlash, is have a product or information set to promote that guides people toward an alternative solution. This way, you’re still capitalizing on the popularity of the product receiving the backlash. But if it’s something that you believe in and it’s a great moneymaker, you might not want to go the opposite direction. If that’s the case, then you need to be up on the latest research about the product. You need to have as many facts lined up as you can so that you can defend the reason behind your support of the product. When you have customer engagement, you’ll grow your business with social proof, but more than that, you’ll be able to design your business in a way so that it caters to the needs of your audience. It used to be that you could engage your audience by sending out an email, but that’s all changed. Customers aren’t interested in a one sided relationship anymore. You can’t just have an online presence. You have to be interactive. You need to engage - and if you think this something that only small businesses do, you’d be mistaken. Big businesses have learned that social proof matters and they’re engaging with their fans. It’s especially important if you’re a solo entrepreneur who doesn’t have the same branding as a big company does on a global scale. Affiliate Marketing has come of age - Join the Revolution Here! You’ll have plenty of opportunities to engage with your audience online. Depending on the social media platform that you’re using, how that engagement takes place might differ. If you’re using Facebook, then you need to have a variety of posts. One mistake that entrepreneurs make is to post the same kind of stuff day in and day out. You need to shake things up a bit so they don’t grow stale. People don’t want to see the same things all the time in the same format. By switching it up, you can see what kind of posts your audience reacts to the most. Use posts of videos, photos, links, pose questions and more to draw your audience in. You can create quizzes, share articles and other content that’s related. You can also do things like asking the audience to caption a photo or have a throwback post. That’s where you post a picture from years past - like funny 80s clothing or old technology to stir up the conversation. Make sure that you post consistently and that you when you do, you’re available to interact with the audience. There’s nothing worse than a drive-by poster. Use a Pinterest account to interact with your audience. You can do things like holding a contest where everyone has to share a photo of something. Re-pin what your audience posts. This causes consumers to submit topics and feel like they’re part of the inner circle. Twitter makes if pretty easy to engage with an audience fast. Make your Twitter account personable. Don’t use a fake profile or avatar. Talk about things that you’re passionate about and share pictures. Talk back to others. Respond, thank people, and share their news to give back. Your audience will feel connected to you. When sharing content that’s not yours, don’t just pass it along, say something even it’s just “love this” and don’t use all the 140 characters. This allows people ease of use for when they pass it on. Get involved in chats that your audience is part of. Keep your sentences short. It’s okay and even eye-catching to not have the sentences on the same line. Use hashtags (#) and @mentions to engage your audience. That’s where you will repost something your audience shared. Make sure you acknowledge where the original post came from. Don’t ever share things just to share them – make sure you support or are intrigued by the idea. Use videos and offer promotions such as telling the audience if they comment, they’re eligible to win a particular prize. Keep an eye on the influencers on Instagram and engage with them. This helps build your audience, too. Take advantage of the hashtags like #follow or use the emotion ones like #happy. Interact with the audience by commenting on the conversations they’re in. But being consistent doesn’t mean posting so often that people get sick and tired of seeing your stuff. There’s a fine line between sharing and spamming and you don’t want to cross that line by not understanding how social media should work. It’s true that you should post frequently. No one can get to know you and you can’t engage with your audience if you’re never around. At the very least, you should post something every day - and those posts should be done often enough so that you build a relationship. How often you should post is going to depend on which site you’re using. If you’re using Pinterest, it’s okay to spread out your posts up to 4 times a day. Just don’t do one giant post. Post in the morning, once in the afternoon, once in the evening and once at night. Each time you post, you can engage with your audience. For Twitter, don’t post more than three times each day. You’ll actually find that your audience starts to grow tired of seeing your content if you post more often than that unless it’s highly useful or reevant. Instagram analytics don’t really show that audience engagement lessens with multiple posting as long as you interact. Facebook interaction should be done once in the morning and once in the evening, minimum. If you post all day long, it looks like you spend all your time there, and you don’t want to give that impression as a leading expert. You might sometimes feel like you don’t have a lot to say on social media. Maybe that’s why you haven’t posted as much as you should. But coming up with something to post is a lot easier than you think. When you do post, make sure that you post something with a picture. Studies have shown that if there’s an image with whatever you post, it gets a higher response rate and people tend to share pictures more than other types of posts. People love to be inspired - and a great way to engage with your audience is to share quotes that inspire them. You can use ones that have a special meaning to you. When you run across something that you really like, save it to your computer in a folder so that you’ll also have a supply of inspiring quotes on hand to share. These quotes can range from business inspiration to personal motivation to quotes that make people stop and think about life in general. The good news is that when they see that quote later, more often than not, they’ll remember that you’re the one who shared it before. If you think that you have trouble knowing what to say on social media, keep in mind that other people do, too. They might see a post they really like but won’t comment on it because they’re too shy or don’t know what to say. You can stir up more engagement by asking questions on your social media sites. People will answer questions because it’s more of a group effort. When they see others responding to the question, they’ll jump in. It’s okay to share posts about new products that you like or even your own products. Just make sure that you don’t let the post come across as a pushy sales post. Instead of hawking the product, you can post it and say something like you just finished working on it and you’re so excited. Then it comes across as you letting them see behind the scenes rather than you turning into a sales person. Share personal stuff, too. This doesn’t mean that you showcase embarrassing things or any family drama. It means sharing a picture of your garden or your vacation. You can share the latest antics of your cat or dog - or an event that you attended. What this does is it makes you come across as a human being rather than a business - and people connect more when they feel like they see the person behind the brand. When you reward your audience for engaging, it helps build loyalty. People love to be rewarded. They love to get something that they weren’t expecting. It helps them feel appreciated. When people feel appreciated by someone, it makes them feel as if they know you and that you’re someone they can build an online relationship with. It’s easy to find ways to make sure you regularly reward your audience. You don’t want to do it so often that people only show up and only interact because they think you’re giving something away every time. But you want to do it often enough so that it makes a difference. Small giveaways throughout the month are appropriate with bigger giveaways spaced out through the year like a grand prize. You can arrange it so that when someone in your audience comments on something that you’ve posted that get access to information or maybe a beta version of a product before anyone else does. People love to have the chance to win prizes too and you’ll see your engagement soar when you offer specific prizes. Gift cards are extremely popular. You can offer coffee store gift cards, bookstore gift cards, ones to restaurants or Amazon gift cards. Some people will use Rafflecopter to handle the entries in any type of contest they have. But that’s not the best course to take because you can have people sharing just the link to the Rafflecopter widget. That means that it won’t increase views or interaction. It also means that people who don’t have the slightest interest in you or your brand will enter the contest multiple times in hopes of winning. Maybe you can give them some new software you created or a special report that’s usually only available in your membership forum. There are endless ways you can go above and beyond with your audience! Knowing when to post something on social media is just as important as knowing what to post. You don’t want to spend time and energy focused on creating engaging posts only to have them disappear unnoticed into the cyber void of social media. This void is what occurs when interest and engagement is at its lowest point – your audience is offline, sleeping or doing other things. If you know when those times are, then you can avoid it. It’s just a fact of life that not everyone is going to be interested in what you have to say. So why not gear your interaction toward the people who do want to hear what it is you share? You can use data to make sure that you’re posting during the times that your audience is most active. By posting during these times, what you post will end up at the top of their feed rather than buried at the bottom. For example, if you use Twitter and you tweet during the week, you don’t want to tweet first thing in the morning. Most people don’t hop right on. They take care of a few things first, then check their social media. So you would want to put your tweet out there in the mid morning. You would also not want to engage in posts on Twitter late at night because that’s when the site is the least active and your tweet could end up getting missed by your target audience. This information can also help you redefine your marketing campaigns when you do those. By knowing when and what to post, you can create content that’s tailor made and hits the mark. You might see something that shows that 65% of your demographic were women while 35% were men. You’ll also be able to see age and relationship, language and the size of their household. You’ll be able to ascertain how often your audience is active on the Facebook site. If you check out page insights, you’ll see the number of people who shared your posts or engaged on your page. Get your - 'Fast Track Guide To Following Through and Staying Motivated' ..... The Free PDF is Here! This blog is purely a collection of 'Private-Label-rights' business tips & Tricks that you may well find useful if you're 'in' the business arena, or if you're contemplating joining the 'business arena'. If you are in toe-dipping mode you should visit; http://bit.ly/2AkVB26 - and check out that (27 x Videos course) that teaches how to make a sustainable income via the internet if you have 'no money' to get started. The Youtube Jolly Where 'EveryOne' WINS!